A diagram of the meiotic phases. 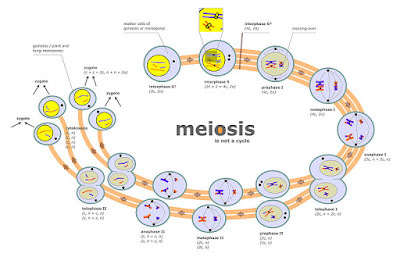 Meiosis I separates homologous chromosomes, producing two haploid cells (23 chromosomes, N in humans), so meiosis I is referred to as a reductional division. A regular diploid human cell contains 46 chromosomes and is considered 2N because it contains 23 pairs of homologous chromosomes. However, after meiosis I, although the cell contains 46 chromatids it is only considered as being N, with 23 chromosomes, because later in anaphase I the sister chromatids will remain together as the spindle pulls the pair toward the pole of the new cell. In meiosis II, an equational division similar to mitosis will occur whereby the sister chromatids are finally split, creating a total of 4 haploid cells (23 chromosomes, N) per daughter cell from the first division. The zygotene stage, also known as zygonema, from Greek words meaning "paired threads", occurs as the chromosomes approximately line up with each other into homologous chromosomes. This is called the bouquet stage because of the way the telomeres cluster at one end of the nucleus. In human fetal oogenesis all developing oocytes develop to this stage and stop before birth. This suspended state is referred to as the dictyotene stage and remains so until puberty. In males, only spermatogonia(Spermatogenesis) exist until meiosis begins at puberty.